It is a great honour to discuss the results of the first OECD Economic Review of Israel. You have demonstrated extraordinary commitment to the accession of Israel to become member of the OECD. This presentation is another milestone in this challenging and reciprocally enriching process. This quote synthesises well the overall message of our report. In fact, we couldn’t agree more! Much of this conclusion is thanks to your leadership in carrying reforms. Through time, and since you were Minister of Finance, you implemented reforms that have helped Israel to grow increasingly open and adaptable to changing global economic conditions. Yet, we have to acknowledge that Israel also faces challenges -- as any country. I will touch upon five points of substance, drawing from our Survey. 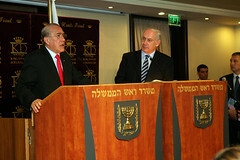 Angel Gurría, OECD Secretary-General and Benjamin Netanyahu, Prime Minister of Israel during the press conference. Prior to the downturn five years of solid growth meant that Israel was firmly on track to catch up with the top OECD countries. And the Bank of Israel was the first in the world to recognise the turn-around last summer. However, the report is critical of the Bank of Israel’s policy of persistent exchange-rate intervention, which risks damaging its credibility if not curtailed. The report also urges a rethink of the structure of financial supervision, something we know is underway. In particular, that role carried out today by the Ministry of Finance should be shifted elsewhere. The trade-off is sharp between tax cuts, which the government is undertaking, and debt reduction, while at the same time accommodating legitimate spending demands. We suggest some caution in pursuing further tax cuts before debt has been lowered to safer levels. Broadening the tax base would also be useful. We support the idea recently discussed of shifting to a budget expenditure rule anchored in a long-term debt objective. We also welcome the two year budget and hope that it will be the first step for a medium term budgeting. There seems to be a widespread problem of weak core skills. We think the New Horizon approach is a good one and needs to be implemented at upper secondary level as well. Outcomes are particularly weak in the Arab-Israeli and Ultra-orthodox communities. More needs to be done to level the playing field for the Arabs and to make learning more vocationally oriented for the haredim. 4. The fruits of development should be better shared by focusing policies on low-income households. We are actually also launching a Labour and Social Policy Review today that addresses issues of a divided society. We endorse your “welfare-to-work” approach in social policy to enhance work incentives. We recommend rolling out Light for Employment and a more generous EITC on a nation-wide basis. Some increase in the level of and access to income support should also be made. Employment rates are shockingly low for Arab women and the Ultra-orthodox, especially men. To overcome the obstacles to their involvement for the Arabs we counsel a drive to eradicate remaining discrimination through more effective enforcement of labour-market regulation and curbing increases in the minimum wage; for the haredim, looking for innovative ways of allowing more women to work from home, for example. Our OECD indicators show that firms are overly hampered by regulation, especially for start-ups. Israel’s support for investment, innovation (including R&D) and SMEs is complex, as in many OECD countries; this calls for regular, in-depth programme assessment. Competition could usefully be made more vigorous in a variety of sectors. Electricity is a prime example, but other network industries could also benefit from liberalisation. And support for the agricultural sector should be pared back. Finally, the transport network is strained and more efforts to improve road connections and expand the rail systems is required. These are the highlights of our main conclusions. I very much hope they can support Israel’s already extraordinary commitment to reform and change, contributing to better policy decisions. I look forward to hearing your views on priorities and policy changes to ensure sustainable growth and better lives for Israeli citizens. The capacities of the OECD are at full disposal of the Israeli government on any areas where we can be of help to Israel and its prosperity. I will be pleased to answer your questions, assisted by our experts who worked at the report and are here with me today.